Among the charms of old records are liner notes. When found on the back jacket of a record, it was promotional copy meant to help convince shoppers to buy that LP. But I wonder how many people actually chose a record because of what was written on the back. So tonight, as y0u listen to this vintage side on The Midnight Tracker, enjoy the liner notes that accompanied it in the record bins of 1969. “Everyday People,” “Knock On Wood,” “Grand Slam,” “Honey Pot,” “Hawaii Five -O” and “Set Free,” Willie Mitchell, from “Soul Bag,” 1969. It’s out of print. This is Side 2. It runs 14:05. “On the flip side of the album, ‘EVERYDAY PEOPLE’ kicks it off. The organ carries the melody singing out a very familiar tune, while the horns handle the chorus. “The million-seller Eddie Floyd standard ‘KNOCK ON WOOD’ is Willie’s next outing and he does beautiful justice to it. At any dance you attend you will be bound to hear request after request for this song, but you will never hear an arrangement that quite touches Willie’s. “Another original ‘GRAND SLAM’ is included that demonstrates the nationally known ‘Memphis Sound.’ It’s the only slow tune on the album, so relax and just enjoy it. “The nicest horns yet are in ‘HONEY POT,’ another Memphis-based tune. The changing tempos used make this song one of my very favorites. “To close the LP Willie uses ‘HAWAII 5-0,’ the popular television show theme with an easy tempo and horns in the lead, and also an original entitled ‘SET FREE.’ This tune is up tempo with very effective guitar work that will not let you sit down. Those liner notes were written in 1969 by Linda Alter, who was a music publicist for more than 35 years. But that year, Alter was working at Pop Tunes, a record store in her hometown of Memphis. She was so good and so personable that she was promoted to head buyer for its parent company, Poplar Tunes, which also had a wholesale arm that sold records to stores and jukeboxes throughout the South. 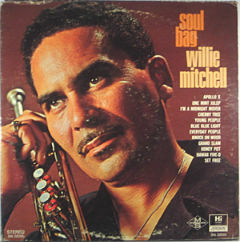 “Soul Bag” came out on Hi Records, so Alter likely was quite familiar with it, and with Willie Mitchell. They all were part of the Poplar Tunes family. Hi — for whom Mitchell started recording in 1960, then became a producer and vice president — was founded by Poplar Tunes co-owner Joe Cuoghi. In 1974, Alter moved to Los Angeles and became the national promotion chief for Shelter Records, one of the first women to have such a job. Leon Russell, who co-founded Shelter in 1969, was one of her first big clients. Alter later worked for the Bang, Motown and Arista labels and became one of the most influential women in the music business. She died in 2005 at age 58.